BY 1879, THE POPULATION of Knowersville had grown sufficiently to merit the construction of a larger school, and the hamlet's third school building was constructed that year on School Street, later renamed Lincoln Avenue. 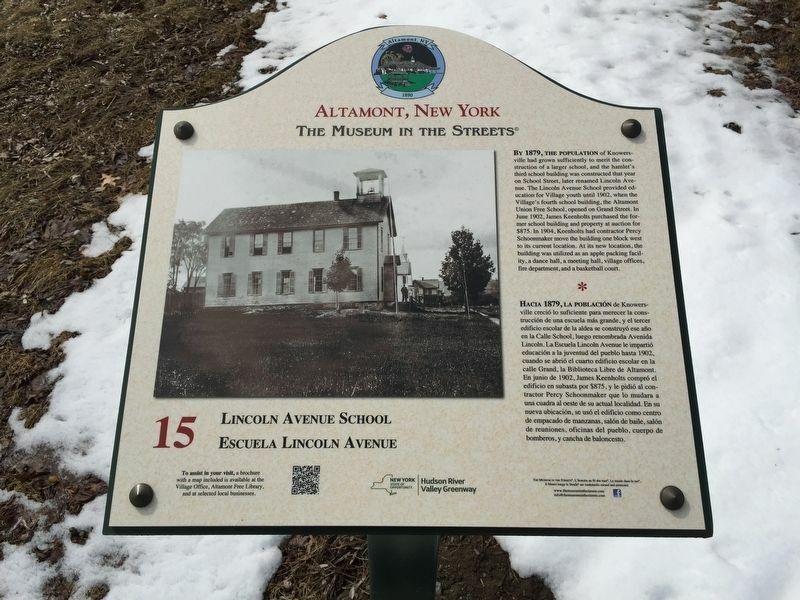 The Lincoln Avenue School provided education for Village youth until 1902, when the Village's fourth school building, the Altamont Union Free School, opened on Grand Street. In June 1902, James Keenholts purchased the former school building and property at auction for $875. In 1904, Keenholts had contractor Percy Schoonmaker move the building one block west to its current location. At its new location, the building was utilized as an apple packing facility, a dance hall, a meeting hall, village offices, fire department, and a basketball court. HACIA 1879, LA POBLACIÓN de Knowersville creció lo suficiente para merecer la construcción de una escuela más grande, y el tercer edificio escolar de la aldea se construyó ese año en la Calle School, luego renombrada Avenida Lincoln. La Escuela Lincoln Avenue le impartió educación a la juventud del pueblo hasta 1902, cuando se abrió el cuarto edificio escolar en la calle Grand, la Biblioteca Libre de Altamont. En junio de 1902, James Keenholts compró el edificio en subasta por $875, y le pidió al contractor Percy Schoonmaker que lo mudara a una cuadra al oeste de su actual localidad. En su nueva ubicación, se usó el edificio como centro de empacado de manzanas, salón de baile, salón de reuniones, oficinas del pueblo, cuerpo de bomberos, y cancha de baloncesto. Location. 42° 42.166′ N, 74° 2.011′ W. Marker is in Altamont, New York, in Albany County. Marker is on Maple Avenue (New York State Route 146), on the left when traveling north. Touch for map. Marker is in this post office area: Altamont NY 12009, United States of America. Touch for directions. Other nearby markers. At least 8 other markers are within walking distance of this marker. The Carriage Works (here, next to this marker); The Great Fire (within shouting distance of this marker); Enterprise Building (within shouting distance of this marker); Fire Department/Village Hall (within shouting distance of this marker); Beebe Harness Shop (within shouting distance of this marker); St. John’s Lutheran Church (within shouting distance of this marker); Altamont (about 600 feet away, measured in a direct line); Home Front Cafe (about 600 feet away). Touch for a list and map of all markers in Altamont. More. Search the internet for Lincoln Avenue School. Credits. This page was last revised on March 29, 2019. This page originally submitted on March 26, 2019, by Steve Stoessel of Niskayuna, New York. This page has been viewed 38 times since then. Photo 1. submitted on March 26, 2019, by Steve Stoessel of Niskayuna, New York. • Bill Pfingsten was the editor who published this page.